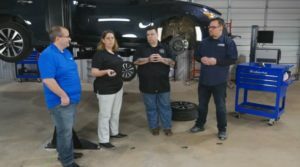 Last month’s “Repair University Live” offered takes on what host Kristen Felder said were three common collision repairer suspension questions related to powertrains, cast parts and used wheels. Two-, four- and all-wheel drive inspections? Should a shop inspect two-wheel-, four-wheel- and all-wheel-drive suspensions differently? The answer is “yes and no,” according to P&L Consultants co-owner Larry Montanez. The inspection processes are the same within each class and relatively similar between all three types, but a couple of extra items come up on the four- and all-wheel-drive suspensions, according to Montanez. Montanez also observed that the nature of the transmission — CVT, automatic or manual — will also dictate slightly different inspection processes, as would various types of rear suspensions. Database Enhancement Gateway Administrator Danny Gredinberg, a former luxury technician, noted that rear active steering — which means another rack and pinion — was also another variable to consider, albeit a rare one. I-CAR curriculum and product development director Josh McFarlin said a customer should be asked if four-wheel drive was engaged during the collision, as it might affect the extent of the damage a shop has to fix. 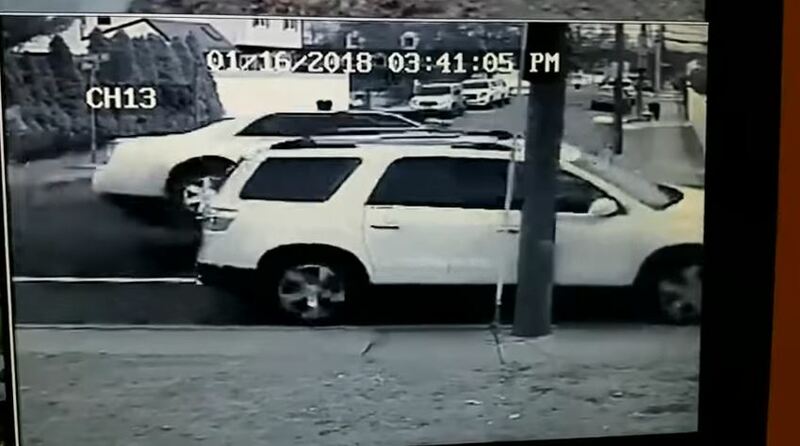 The group referenced a video shown earlier in the presentation of a parked, unoccupied vehicle sideswiped by a car on the left side. The victim SUV’s front wheels can be seen rolling forward, stopping, and then rolling backward. On as four-wheel-drive vehicle, the front wheels might be mechanically disconnected, and potentially undamaged by the impact, according to Montanez. An all-wheel-drive vehicle could go either way, depending on its speed, and a front-wheel-drive system would be “definitely damaged,” he said. A common repair adage holds that cast components are going to either be broken or fine — there’s no middle ground. Is that correct? Cast components can bend, and “more often than not, they do bend,” he said. “This is a major, major issue that many people don’t understand,” Montanez said. He said he’s seen mounting loads move “drastically” on an engine cradle. It’s a matter of energy transfer. 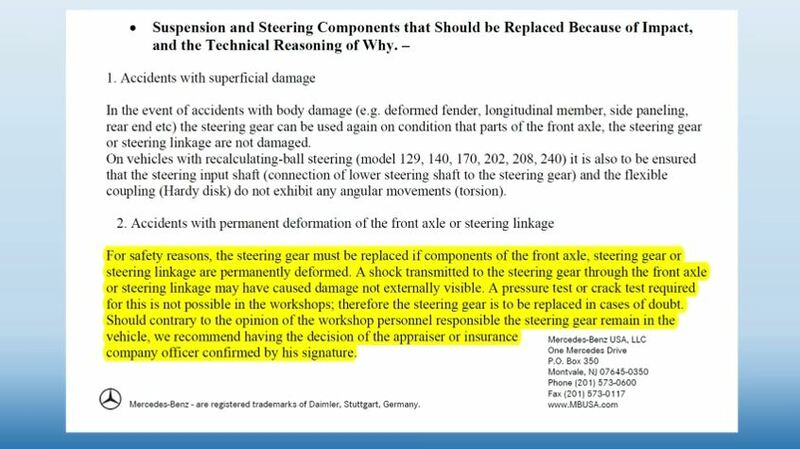 A Mercedes document on the show recommends that a repairer secure a signature from an insurer who seeks to overrule the shop’s opinion on the need for this steering gear replacement. “The judge will laugh,” said Felder, Collision Hub’s CEO, who like Montanez testifies as an expert witness. What about recycled suspension parts and wheels? “The parts may be good,” Felder said. However, the repairer might not know the part’s history, both on the donor vehicle and during the salvage process, she said. That uncertainty made them too risky, the show suggested. “It’s your liability,” Montanez said. A part which looks fine might have been affected by collision energy during the crash. Montanez cited the example of a frontal collision crash test video played on the show which shows how the impact to the front of the car is felt by the back wheel and door. They appear undamaged, but clearly react to the energy of the crash. “What happens to the back end of it?” Montanez said. Are you going to put that rear suspension in your customer’s vehicle and then find “it won’t take a wheel alignment because components are bent?” he asked. There’s also the question of how much TLC the recycler gave the part. A salvage yard might be unbolting and dropping to the ground components from a lifted vehicle during disassembly, according to Felder. “How it’s cared for, stored, transported; there are all of these things that come into play,” Felder said. The same issue arose for recycled wheels, she said. “You don’t know what’s been done to that wheel,” she said.